Thunder is a Scary Sound. . .
That’s because all thunderstorms are dangerous. Every thunderstorm produces lightning. 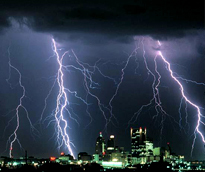 In the U.S. an average of 300 people are injured and 80 are killed each year by lightning. Other associated dangers of thunderstorms include tornadoes, strong winds, hail, and flash flooding. Flash flooding is responsible for more fatalities – more than 140 annually – than any other thunderstorm-associated hazard. BE INFORMED To lessen the danger you must understand any severe weather alert. Thunderstorm Watch – Conditions are favorable for severe thunderstorms in and near the watch area. Stay informed and be ready to take shelter. Thunderstorm Warning – Sever weather has been reported or indicated by radar and indicates imminent danger to life and property. Take shelter. Determine a safe place in your home for household members to gather during a thunderstorm. This should be away from windows, skylights and glass doors that could be broken by strong winds or hail. Don’t forget about your pets. Protect them also. If a severe thunderstorm warning is issued; immediately take shelter in a substantial building or in a vehicle with the windows closed. Get out of mobile homes that can blow over in high winds. Avoid electrical equipment and corded telephones. Avoid showering and bathing. Plumbing and bathroom fixtures can conduct electricity (lightning). We may benefit from the rain, but be respectful of the strong winds, hail, lightning , and flooding.